Ramadan can be an incredibly busy time in the Moroccan kitchen. Although the holy month of fasting is intended to be a spiritual time, the types and variety of foods traditionally served to break the fast at Iftar can be very time-consuming to make in comparison to regular meal preparations. Below are suggestions of ingredients to prep and foods to prepare in advance of the beginning of Ramadan. By planning ahead and stocking your freezer in the weeks prior to fasting, you'll find that Iftar becomes a much more manageable task, even when feeding a crowd. Two Ramadan essentials in Morocco are a honey-dipped cookie called chebakia and a powdery confection called sellou, both of which require a significant quantity of golden unhulled sesame seeds, or janjlane. 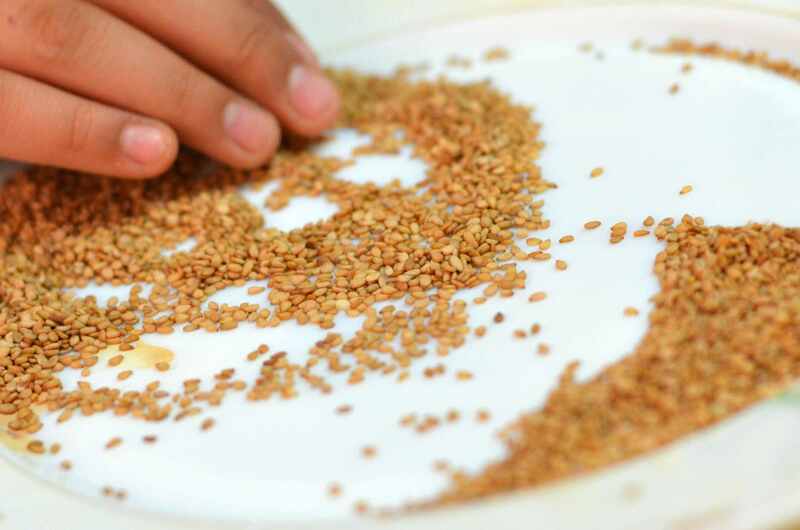 The sesame must be cleaned thoroughly and picked through to remove any debris. This work can be done weeks or even months in advance, so plan ahead and get this tedious task out of the way. Once done, you can move on to toasting the sesame. Almonds are another ingredient that will be used in large quantity for traditional Ramadan treats such as sellou, almond briouats, and almond-filled makrout. Most Moroccan recipes call for blanched and peeled almonds; many also call for frying the almonds. Get the peeling done well ahead of time (store the dry blanched almonds in the fridge) and reserve the frying for the day before making your sweets. This Iftar essential is work-intensive to make, so families traditionally make a large batch intended to last the entire month of Ramadan. It can be prepared several weeks ahead of time, or even further in advance if you freeze it until the month of fasting begins. These step-by-step photos will walk you through the process of how sellou or sfouf is made. Another time-consuming sweet that's considered a must-have on Iftar tables is Helwa Chebakia. Days or weeks before Ramadan, families will make a large enough batch to carry them through the month. They store well at room temperature, but will also freeze beautifully, allowing you to get this task out of the way well in advance. Dried chickpeas are an essential ingredient in Moroccan kitchens; in Ramadan, they're mostly used to make a chickpea, lentil and tomato soup called harira. Because the soup is time-consuming to prepare and gets made frequently during the month of fasting, many Moroccans will soak and peel the chickpeas in advance, then freeze until needed. Another time-saver for making harira is to prep and freeze the generous amounts of parsley, cilantro, and celery that typically go into a single batch of soup. Once washed and chopped (a food processor or double handle mincing knife will speed up the chopping), simply measure bowlfuls of the combined herbs into individual freezer bags. Tomatoes are also essential to harira. Traditionally they are stewed and then passed through a hand-cranked food mill to remove seeds and skin, but you can also opt to grate very ripe tomatoes to a pulp as shown here. Another option is to process seeded tomatoes (you can even leave the skin on) along with onions in a food processor; portion out for single batches of soup and freeze until needed. Briouats are sweet or savory filled pastries which are fried or baked. Similar to samosas or spring rolls but wrapped in paper-thin pastry called warqa, they're immensely popular in Morocco, particularly during Ramadan. A variety of briouats can be filled, shaped and then frozen in large numbers; later on, take only as many as are needed to cook in time for an evening Iftar. One of the most refreshing and satisfying offerings at a Moroccan Iftar is juice or 'assir. Although the juice which is served might be a commercially packaged product, it is more common for families to make a variety of milkshakes and juice blends with generous quantities of fruit. It's very helpful to buy the fruit in bulk then wash, cut-up and freeze the fruit in portions, ready to go into the blender. The link takes you to a tutorial showing how to make basic square-shaped rghaif called msemen; you'll also want to view the photo tutorial on how to make round, coil-shaped. Both are considered must-haves in many families, either for a pre-dawn breakfast or in the evening when it's time to break the fast. Make a stash ahead of time and freeze them. They reheat beautifully in just a few minutes either stove top or in the oven. Items such as filled msemen, stuffed batbouts, savory croissants, and filled flatbreads are all Moroccan favorites when breaking the fast. These and other savory and stuffed breads can be fully made In the days or weeks prior to Ramadan and then frozen until needed for reheating. Sweet rolls, krachel, brioches, beignets, and leavened croissants are examples of other breads that freeze well, so get busy baking before the days of fasting are upon you. The sweetbreads can be offered at either the pre-dawn meal which precedes a day of fasting or presented alongside other fares for breaking the fast at sunset. Batbout is a pita-like bread that's made stovetop, and you'll want to keep a steady supply in your freezer to add to your spread of food at Iftar. They can be made as small or large as you like and then stuffed as desired with various sandwich fillers. In Ramadan, petite batbout are especially popular. Puff pastry dough (pate feuilletee) is a wonderfully versatile dough to keep on hand for making sweet and savory tarts, quiches, pastries, savory unleavened croissants and more. This tutorial shows you how to make your own puff pastry dough which can be frozen until needed. Croissants are obviously a French influence in Moroccan, and you'll find that you can make an array of sweets with unleavened croissant pastry. Some popular ones in Morocco are chneiks, petit pain au chocolat, and almond croissants. Make the croissant dough yourself and have it ready in the freezer to minimize work on baking day.